Handles and feet break very easily on silver plate. They are made from cast white metal and soldered on with low temperature solder. The attachment is not strong. Repairing antique and vintage silver plate takes great skill to avoid damaging the silver plating. In addition, the feet and handles melt at very close to the same temperature as the solder. These silver objects may not have great intrinsic value, but hold great sentimental value. The handle on this silver plate dish was broken off. These handles are cast white metal but can be soldered back on with great care to preserve the silver plating. 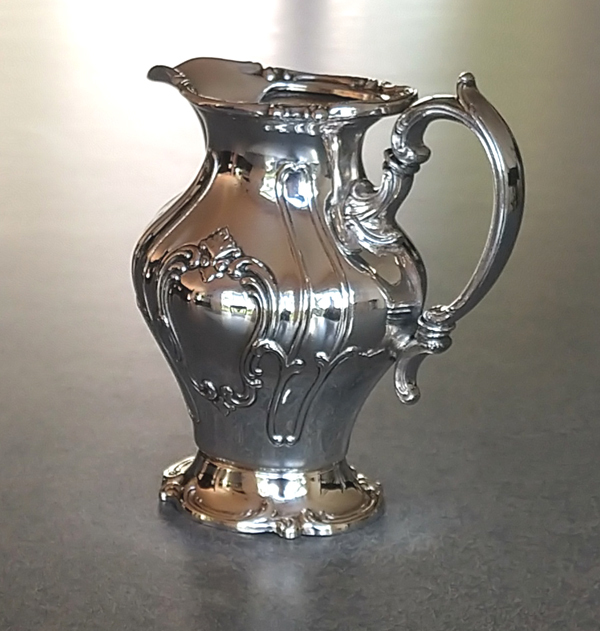 After the handle was repaired the silver plating was polished lightly. The final result (right photo) was a vast improvement in the appearance and function. The handles on silverplate are white metal which is both brittle, and not very strong. For this reason, the handles break easily. I can solder the handles back together. In this case I added a sterling silver wire at the breaks to reinforce the handle and conceal the repair. Feet often break off silverplate trays as in this example (right photo.) The feet can be soldered back with great skill and care. The difficulty is that the low temperature solder is very close to the melting temperature of the cast white metal feet. If a foot or handles breaks off your silver be very careful to save this for future repair. There is no source for extra feet or handles for silverplate. Do not use glue. It will not hold. When a silver plate object arrives with glue, I have to remove the glue very carefully trying not to damage the silver plating. This adds to the cost of repair because the glue really sticks to the silver even though it was not strong enough to hold the handle. This sugar bowl was successfully repaired and returned to the customer. Antique silver plate castor stands are just beautiful with interesting Victorian ornamentation, but they are also very fragile. Most of the Victorian Caster Stands are white metal which is very soft. Over time the metal fatigues or gets a little wonky. In this example, the main stem broke near the base at an indentation in the metal. I repaired the break concealing the repair with sterling silver wire. This also reinforced and strengthen the repair. 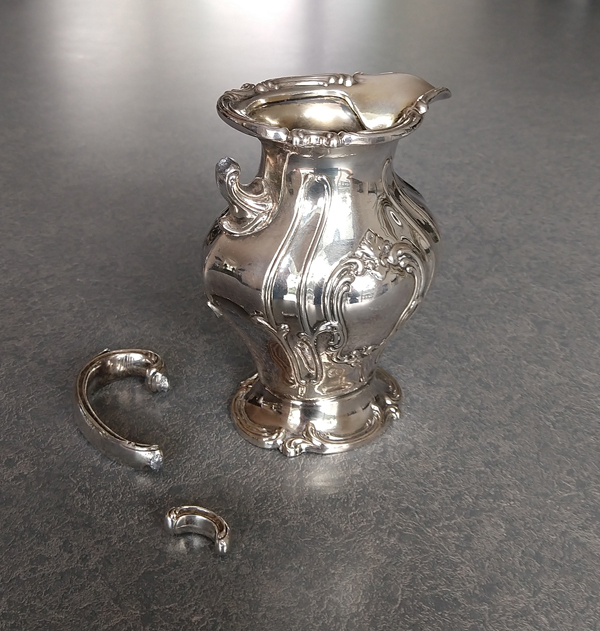 By using sterling silver for the repair it was not necessary to replate this castor stand. This hot water kettle arrived with the support stand broken off and small leaves from the lid finial were also broken (left photo.) Thank goodness the customer saved all the broken pieces as there is no such thing as replacement parts for old silver. After this hot water kettle was repaired, professional polishing transformed its appearance dramatically.